The three-storey atrium overlooks the beautiful sea, with unique food and beverage restaurants to choose from. Bright lights from the large window, high ceilings and gentle wooden interior create an open and casual atmosphere at this unique seaside resort. Using the finest selection of Hokkaido's ingredients, we offer a wide range of cuisines from authentic Italian to delicious Japanese cuisine, from unique Otaru sushi to beautiful desserts, in a variety of styles such as casual buffets as well as formal courses. Terrace Brasserie, a modern seaside restaurant with panoramic views of Otaru Marina. An open space created by large windows and high ceilings, you can enjoy a wide variety of dishes served from the open kitchen - buffet style from breakfast to lunch and dinner. A modern and stylish dining restaurant that takes inspiration from a cabin of a luxury passenger ship. You can enjoy a variety of menus centered on exquisite authentic Italian, along with carefully selected wines, premium whiskey in Hokkaido, original cocktails. Enjoy the Japanese food in delicate Kaiseki, traditional Sushi and rich Teppanyaki styles, with ingredients from the mountain and from the sea of Hokkaido. Take a seat in the separate private room and you'll feast on traditional and exceptional culinary experience with high-class service. 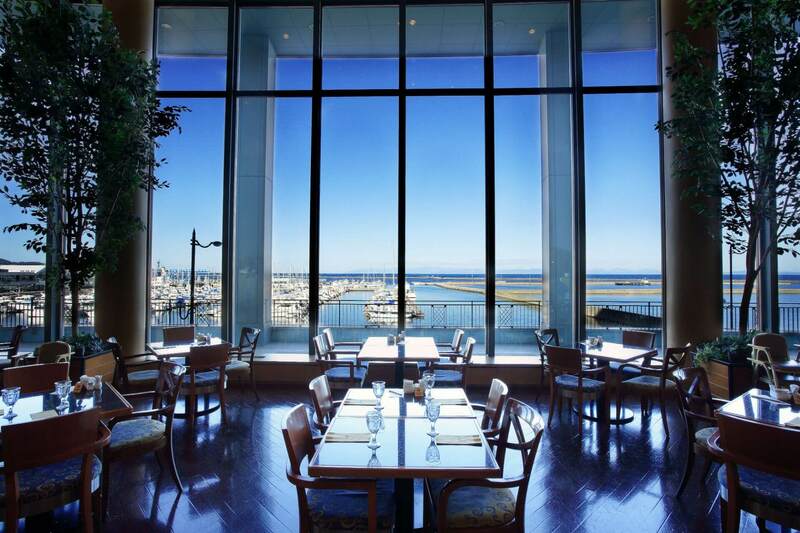 Overlooking the blue sea and the Otaru Marina, the Bay Lounge with a high ceiling exudes exceptionally clear space. Enjoy a casual coffee break and relaxing tea time in the afternoon with plenty of specialty sweets in the spacious and open lounge. A pastry shop with plenty of breads and sweets using Hokkaido's famed dairy products and fruits. On top of old favorite best seller items, there are new items with seasonal ingredients that are also available. In addition, we provide items for special occasions such as birthdays, anniversary cakes, Christmas and Valentine's Day.